According to the journal of clinical nutrition, it is estimated that the majority of the world’s population, roughly 4 billion people follow a plant-based diet, indicating that engaging in a plant-based diet is not just a trend. So when you hear your work colleague brag about eating a plant-based diet; tell them to join the club… which has 4 billion members. So what does a plant-based diet consist of? First of all, plant-based foods derive from plants and do not contain animal ingredients such as meat, milk, eggs, or honey. What it does include is fruit, vegetables, grains, pulses, legumes, nuts and meat substitutes such as soy products. The demand for eating plant-based foods has increased 140% since 2017, which could be why the overall value of the plant-based food sector is now $5 billion. Research suggests that only 1% of the UK population meet government dietary guidelines, but by shifting to a plant-based diet, you will meet your ‘five-a-day’ target and intake the government’s recommended 30g of fibre per day. You will also consume an adequate amount of vitamins and minerals which are so important for good health. Additionally you should be able to reduce salt, saturated fat and refined sugar intake. AND YES, you will get enough protein! 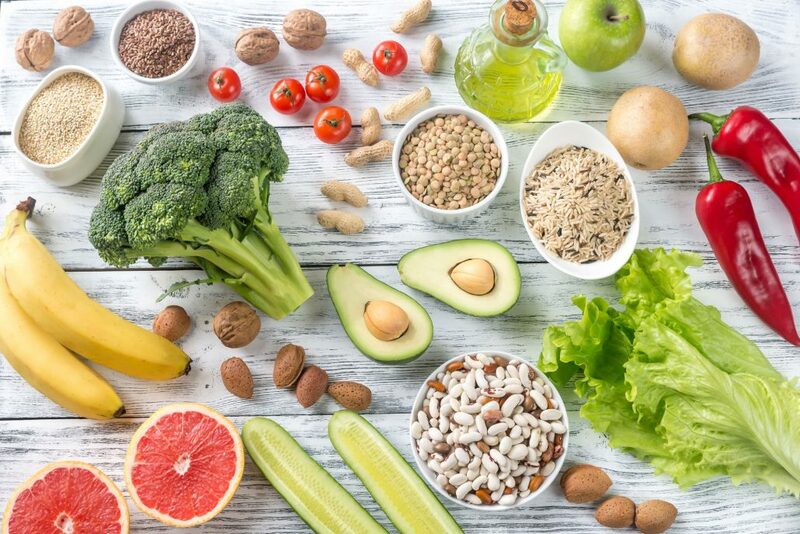 A well-balanced, plant-based diet provides significant health benefits which include a lower body mass index (BMI), lower cholesterol levels, and reducing the chances of type 2 diabetes, heart disease and the protection of some cancers including prostate and breast cancer. These benefits indicate that it is not just a lifestyle choice or trend, it is a necessity for your health. We are not preachers, we at Nature’s Store understand that changing your diet can be difficult and this is why we suggest you do so slowly; especially if you are on the fence of joining the 4 billion member club. Perhaps introduce two or three plant-based meals a week, as this will allow you to experiment with new foods and build up some recipes over a period of time; or follow our easy 8 step plan below which will help you meet those government dietary recommendations. Do not be discouraged by the potential challenges you might face; introducing more plant-based foods into your diet far exceeds the challenges. And if you are a plant-based diet veteran, or ready to make the switch, we have provided a healthy days’ worth of recipes for you. Stuck for ideas? Here is a daily plant-based diet that is easily accessible to you. Breakfast Gluten-free pancakes with a dollop of Nature’s Store hazelnut and cocoa spread, surrounded by fruits. Chickpea rice, olive oil, fresh parsley, tomatoes, cucumber, fresh lemon juice. “The food is tedious and lacks flavour”… said nobody eating a plant-based diet. “Not really a fan of fruit and vegetables” … approximately 2000 types of fruits worldwide, of which the western world only uses 10% of those. Approximately 2,000 species of plants are edible by humans. “I love a dessert after my meal” … You have many fruits to choose from, substitute your cheesecake for an exotic fruit that your body will thank you for. “What if I go to a restaurant with friends” … the social aspect of our diet can be a challenge, but most social events facilitate individuals who eat a plant-based diet. For example, most restaurants offer plant-based options that are readily available and easy to identify. “It all seems so time consuming”… as you become more invested in your plant-based diet, you will find workarounds and ways to decrease the amount of time and energy required to prepare good tasting meals. “So expensive” … we understand that it can be discouraging walking through the organic section and seeing expensive prices. However, the quality of food reduces the quantity required, and as a whole, foods tend to meet your dietary requirements quicker. I.e. you get full faster.